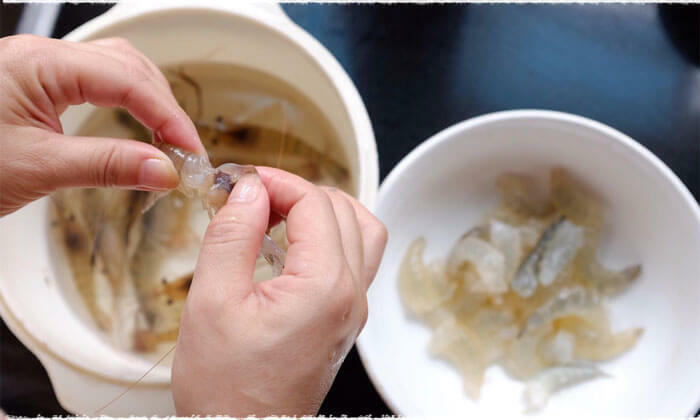 Today, Teavivre is going to teach you how to cook famous Longjing Stir Fried Prawns with Longjing Tea (龙井虾仁), which is a specialty of Hangzhou City, Zhejiang Province. Stir Fried Prawns with Longjing Tea (Longjing Shrimp for short) is a typical dish of Hangzhou cuisine. 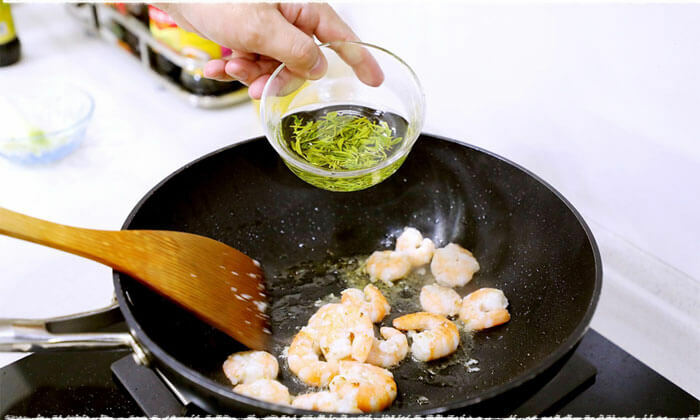 Just as its name implies, Longjing Shrimp is made by cooking peeled river prawns with tender shoots of famous Longjing tea. 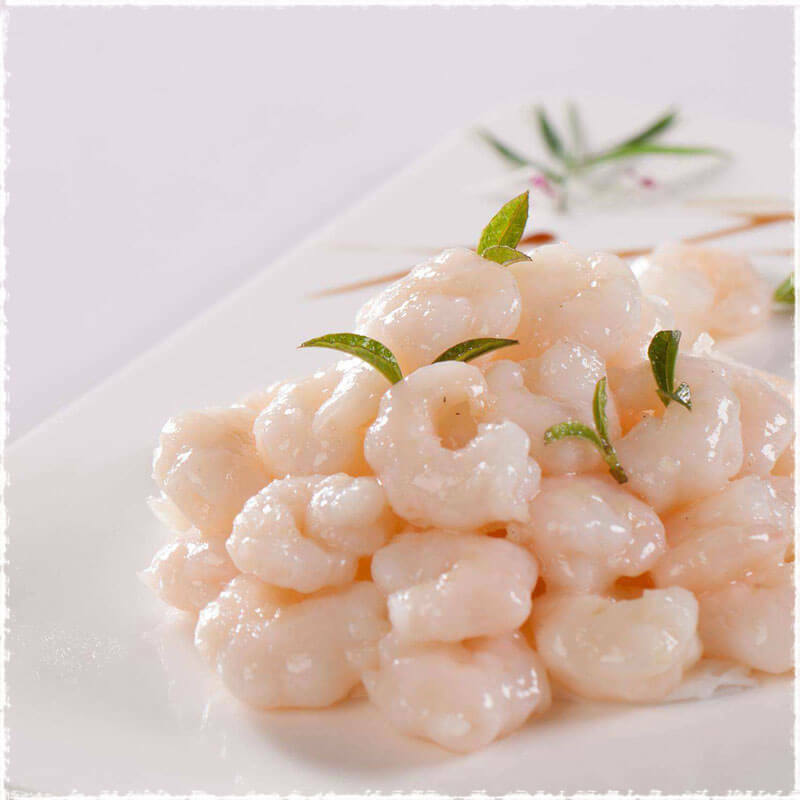 Together, the smoothness of the jade-white shrimp and the fresh bitter note of green tea leaves create a tasty balance of texture, taste and color. Longjing tea (龙井茶,Dragon Well tea) is a famous variety of green tea from Hangzhou in the Zhejiang province in China. Renowned for its high quality and intensely fragrant body, Longjing tea is well regarded as one of the most famous teas produced in China. Longjing tea possesses four qualities that set it above other teas: emerald green color, aromatic flavor, overall appearance, and crisp and refreshing taste. Stir Fried Prawns with Longjing Tea is made from big, live river prawns and cooked with fresh Longjing tea picked around Tomb-sweeping Day. 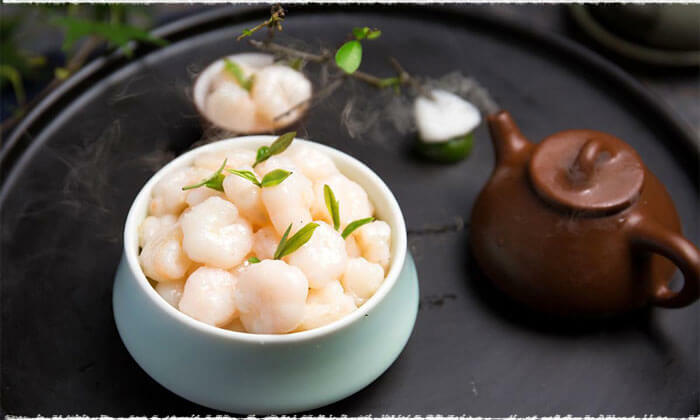 The peeled prawns are white, fresh and tender and the tea shoots are dark green with a fresh scent and an elegant color, as well as a distinctive flavor. After eating this dish, one will feel refreshed and his appetite will be stimulated. It is a famous traditional Hangzhou dish with outstanding flavor. 2. Put some cooking wine and the egg white liquid in and stir them until they are sticky then add a small amount of cooking starch (too much starch make them appear less crystal clear). Cover them with preservative film and then refrigerate them for 2 hours. 3. 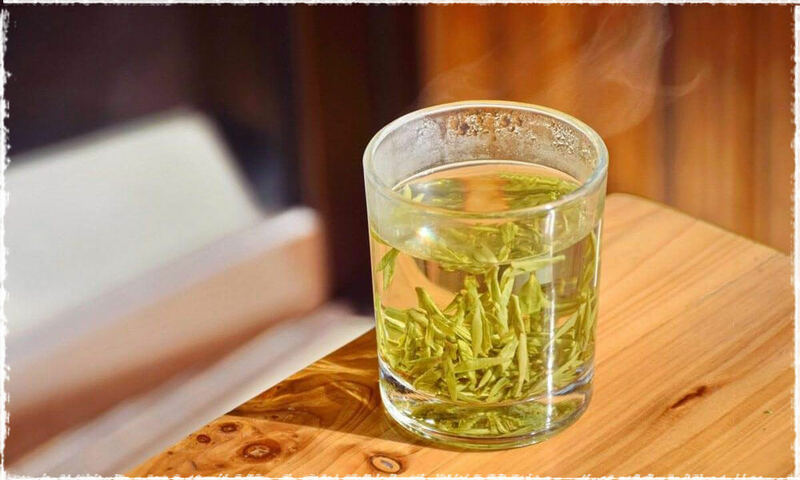 Brew your Longjing tea with water at 70 – 80 ℃ for about 60 Seconds .Leave the tea water and leaves for later use. 4. 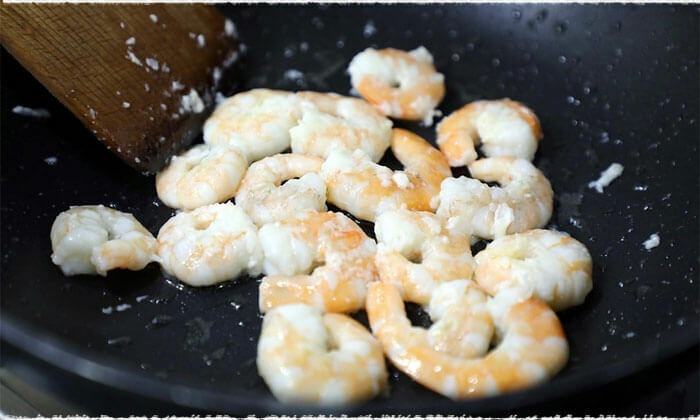 Heat the wok and toss in the shrimps when the oil is 70% heated. Stir them with chopsticks rapidly. 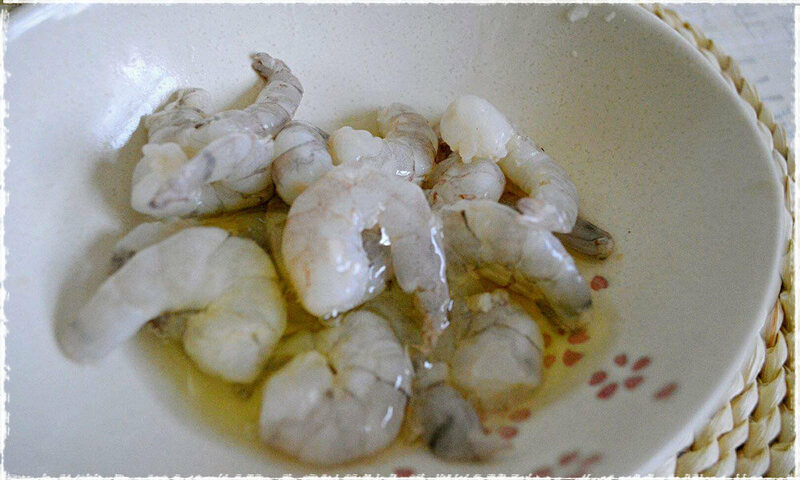 When the prawns are white like jade (avoid being over-cooked), take them out by putting them in a colander to drain the oil and set aside. 5. Wash the wok. Add in the tea liquid and moderate amount of cooking wine and bring them to a boil. Keep heating and put shrimps in then quickly stir fry. Add in essence of chicken and stir until even. Green tea such as Longjing is rich in antioxidants, vitamins and amino acids. Tender river shrimp is high in protein and easy to digest, especially beneficial to the week. Together, the two ingredients form a perfect balance of nutrient content, color, texture and taste. Note: Though this dish is good for health, it is unfit for those people who are allergic to seafood. An alternative anecdotal tale about the invention of this dish can be traced back to Qing Dynasty (1616 A.D. – 1911 A.D.). The story of Longjing shrimp, like many other classic dishes, relates to the Qianlong Emperor (乾隆皇帝), who is known for his obsession with the region of Southern China (江南) and food there. One day in early spring, dressed up as a tourist (to avoid being recognized by people), Qianlong along with his fellow travelers was strolling around the beautiful West Lake in Hangzhou as usual. Suddenly, a heavy shower of rain came falling from the clouds and he had to head to a farmhouse nearby for shelter. The hospitable hostess welcomed him by serving him a cup of fresh Longjing tea. The brew carried such a delicious fragrance that the overjoyed emperor could not resist thinking of taking some back for private enjoyment. To directly ask for some, he thought, was a little bit undignified, especially in the presence of his followers. So he grabbed some tea leaves stealthily from the hostess’ tea basket. After the rain, he left the farmhouse and continued his journey till the sun fell. Feeling thirsty and hungry, he found a restaurant and ordered some dishes there. As Qianlong was very thirsty, he asked the waiter to steep a cup of longjing tea for him. When he was trying to take out some longjing tea leaves from his pocket, the waiter glimpsed his inner dragon roble, a cloth only for the emperor, and was shocked. The waiter went back to the kitchen in a hurry and told the chef. The chef who was cooking the plain fried shrimps was also shocked. Reeling from the shock, the chef mistook the tea leaves for chopped green onion and mixed them with the shrimps. Therefore, the dish became “shrimps with tea”. Qianlong was so hungry that when he saw this dish he couldn’t wait to have a try. The dish turned out surprisingly well – the luminescent pink-white color of the shrimp with the green leaves scattered among them won the emperor over. Since then, Long Jing Shrimp became a famous specialty in Hangzhou. PreviousPrevious post:How to choose the right tea for yourself?